An Australian beer company owned by SABMiller is recalling more than one million bottles of beer that could contain broken glass. The recall affects Carlton Dry 355mL bottles with expiration dates of July 19 and 20, 2016. The beers, produced in October by Carlton & United Breweries in Queensland, are also marked with a "3" on the cartons, or a "3A" or "3B" on bottles. "This sort of thing is rare but we take the quality of our beers seriously," the company said in a statement. 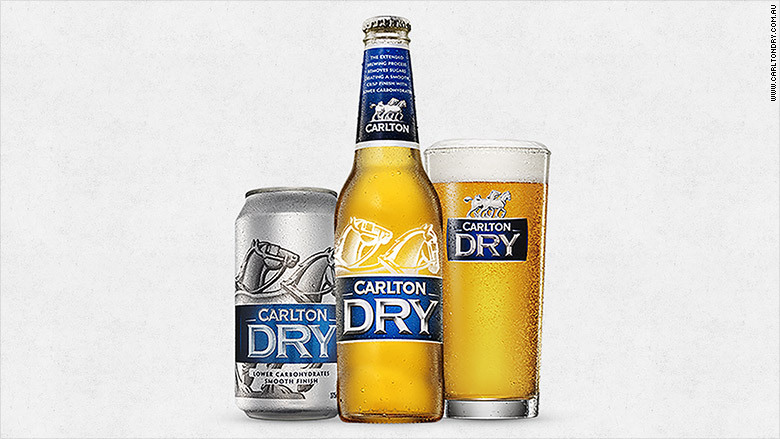 Carlton and United sells roughly 240 million bottles of Carlton Dry a year, so the recall affects less than 1% of what typically hits store shelves. The brewer's owner, SABMiller (SBMRF), is being bought by the world's biggest beer firm ABInBev in a $100 billion deal. The merger, if approved, would create a super brewery with sales of $55 billion, with nine of the world's top 20 beers by volume. Antitrust regulators are putting the deal under the microscope -- the concern is that the combined company would wield too much power in key markets, resulting in higher beer prices for consumers. The recall was issued after Carlton & United received about a dozen complaints from customers about a chip at the top of the glass beer bottles, said company spokeswoman Jennifer Howard. The company suspects the chip may have occurred during the bottling process, but it is still investigating and confirming the source of the broken glass, she said. Its beers are sold at major retailers, such as Woolworths, across Australia, as well as independent bars and restaurants.